Doing your viva in Politics has been revolutionised by a new mock viva video for Ph.D. students. Politics PGR Director Professor Tony Zito and Kate Manzo (Geography) realised that students often were not attending or were not paying attention to more traditional approaches to preparing students for their viva, so he decided to show them exactly what to expect by making a video. Tony said: ‘A lot of students were just not coming to the sessions I was running about vivas and what their viva would be like. ‘I think for those who were in first or second year of their Ph.D.s their viva seemed very far away and for those nearing the end of their project the viva had become something too scary to think about. Tony enlisted the help of politics student Russell Foster, himself preparing for an upcoming viva. Russell agreed to be filmed during a mock viva with Tony and Kate taking the roles of internal and external examiners. The mock viva was kept very formal, with Russell entering the room in a suit to greet his examiners, just like in the real thing. ‘It was great of Russell to agree to do that on camera because it’s a pretty scary thing but he was happy to help other students. ‘The video worked really well and will hopefully give other students an idea of what to expect as their viva looms. The video was posted on Youtube, with Russell’s permission and is used frequently as a resource for students in GPS approaching the end of their Ph.D.s. Thinking of doing a similar thing in your school? Contact LTDS@ncl.ac.uk for more information or for technical support. For more examples of good practice in teaching and learning from across Newcastle have a look at the Case Studies Database. 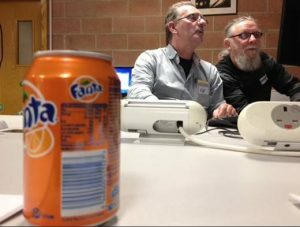 The recent Pizza, Pop and Practice workshop on Sound and Vision, looking at making recordings and short video clips for use in teaching, was a tremendous success. Participants enjoyed their pizza and pop, whilst learning about Audacity (which enables you to make short sound recordings and clips), Animoto (which allows you to make short video clips to advertise events or explain simple concepts – see Jo’s video about the workshop below), as well as looking at ways to use Microsoft Office Mix to create videos and recordings for use in powerpoints or online. Thanks to everyone who came along and thanks in particular to Lucy Keating, Marc Bennett, Jo Robinson-Lamb and Nuala Davis for delivering such interesting workshops! All of the materials from the workshops are now available on this blog. Interested in using these materials in your teaching? Contact LTDS for more information and support. 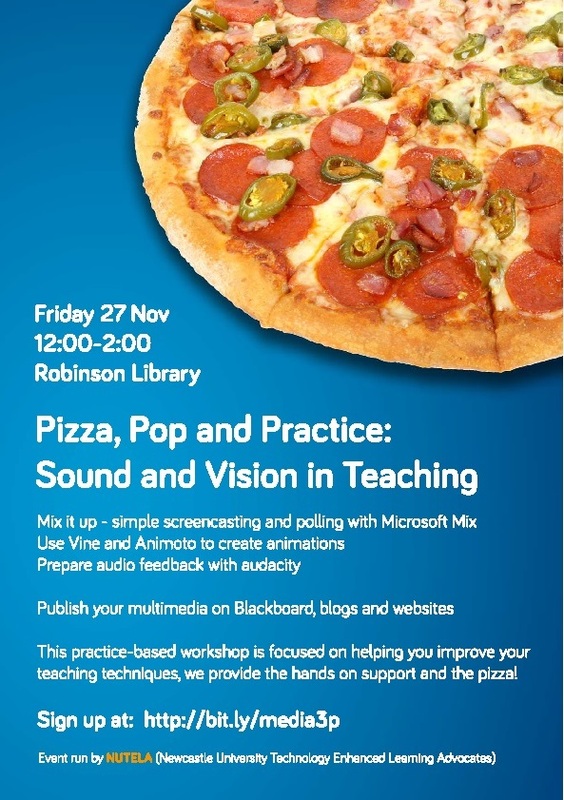 NUTELA will hold it’s first Pizza, Pop and Practice workshop of this academic year in the Tees Cluster at the Robinson Library on Friday 27th November 2015. The workshop, entitled Sound and Vision in Teaching, will showcase techniques to use video and sound editing software to create short film sequences and audio recordings for teaching. 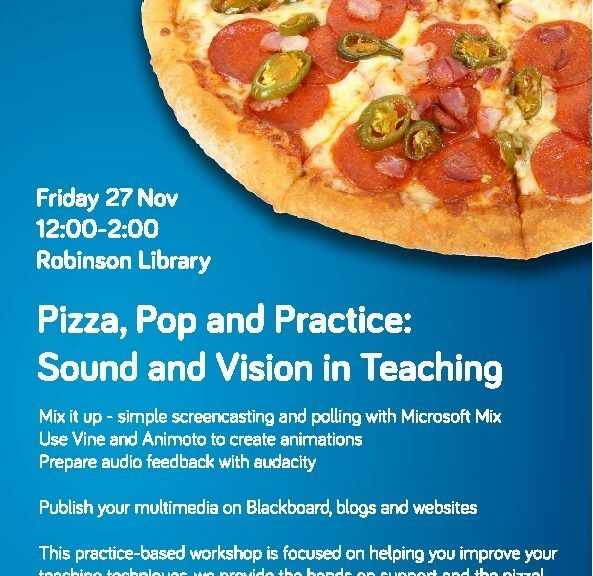 As well as vast quantities of FREE PIZZA and POP over lunchtime, the event will offer a series of short workshops to show participants how to use Microsoft Mix to put together or mix up words and images, Vine and Animoto to make short animations and Audacity to record short sound clips. Participants must register for catering purposes. We were delighted to chat to David Heslop, the City Archaeologist for Newcastle upon Tyne (known affectionately to it’s residents as “the Toon”). David’s written widely on the archaeology of Newcastle, and the reconstruction picture you see in our week 3 text is taken from his book with Zoe McAuley Digging Deeper: The Origin’s of Newcastle and Gateshead. We chatted about how archaeological evidence is uncovered and preserved during the development of new buildings; what we do and don’t know about the course of the wall through the city centre and about what has changed and what has stayed the same. For me Newcastle Quayside is never going to seem the same! David explained how this artificially flat area was created through land reclamation in the medieval period. The River Tyne is tidal in city and, of course, safe quayside spots were essential as trade expanded. Once you hear this, of course it becomes obvious – you can begin to see the how the steep descents to quayside bars mirror the drops to the original banks of the river in the Roman town. We experimented with merging David’s picture with one from the Northumbria University’s Virtual NewcastleGateshead project. You can see the results of our photoshop efforts in the YouTube video above. How do you think we got on? For those interested in browsing through the region’s records of Roman evidence do pay a visit to Sitelines (Tyne and Wear’s Historic Environment Record). This video will demonstrate how to embed video and audio within ePortfolio.